A Foreign Trade Zone (FTZ) is a site in or near a U.S. Customs port of entry where foreign and domestic merchandise is generally considered to be international commerce. Foreign or domestic merchandise may enter this enclave without a formal Customs entry or the payment of Customs duties or government excise taxes. What can I do or store in the FTZ? Zone procedures provide one of the most flexible methods of handling domestic and imported merchandise. Entrepreneurs are using FTZs with a creativity that portends a new beginning of real benefits for global orientation. Companies both large and small are taking advantage of the direct savings. Companies large and small and in nearly every industry have found profitable homes in FTZs, and the list is growing. If the final product is exported from the United States, no U.S. Customs duty or excise tax is levied. If, however, the final product is imported into the United States, Customs duty and excise taxes are due only at the time of transfer from the FTZ and formal entry into the United States. The duty paid is the lower of that which is applicable to the product itself or its component parts. Thus, Zones present opportunities to realize Customs duty savings by Zone users. Is an FTZ right for my company? There are many benefits to having your company become an FTZ. If you can say yes to ANY of these following questions, then an FTZ might be right for you. Does your company import; and, if so, are the imported items/components dutiable? Do you keep inventory for more than a few weeks? Is the frequency of your shipments more than five times a month? Does your company use imported components for assembly? Does your company re-export any imported products? Are you a logistics company looking for a competitive advantage? 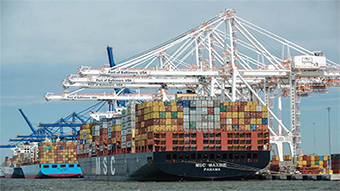 Contact the Baltimore Development Corporation (www.baltimoredevelopment.com) to find out how an FTZ can help your company. How many Foreign Trade Zones are found in Maryland? What is the ASF designation for Baltimore? Baltimore’s FTZ has received the Alternative Site Framework (ASF) designation from the U.S. Department of Commerce. This is an optional program to manage U.S. FTZ sites. ASF gives much greater flexibility to FTZs by using simpler and less time-consuming procedures to bring FTZ designations to locations where a company has decided to pursue an FTZ. The ASF was created when the old, traditional site-management framework got to be outdated and imposed major burdens on everyone involved because it consumed too much in government resources. The new framework greatly speeds up the process for local manufacturers and exporters to become designated by reducing the paperwork in the application process and expedites the decision-making process from one year to 60 days. How large is the City of Baltimore’s FTZ #74? Established in 1982, the City of Baltimore’s Foreign Trade Zone, FTZ #74, has been continually expanded and modified due to various requests for additional space. 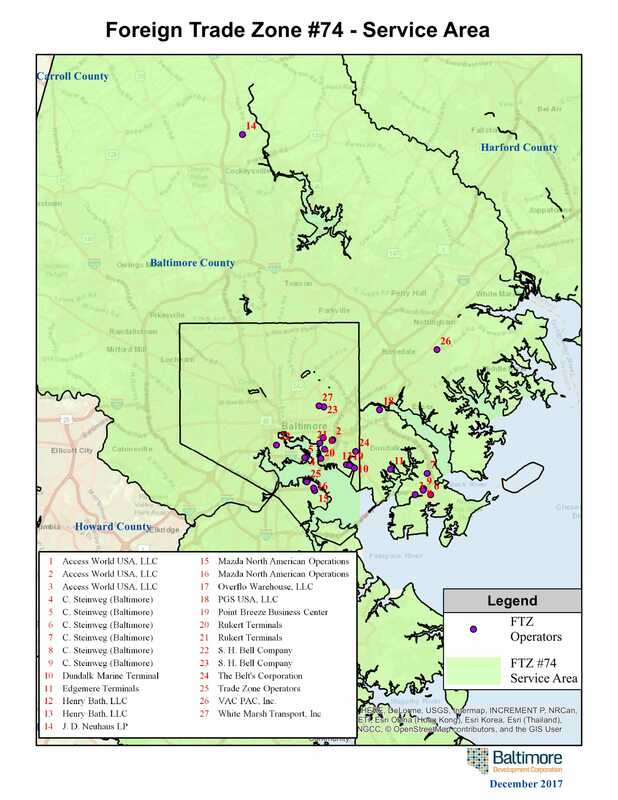 Zone space, originally 60,000 square feet, currently contains more than 1,254 acres at 33 sites within the City of Baltimore, Harford, Cecil, Baltimore and Anne Arundel counties.